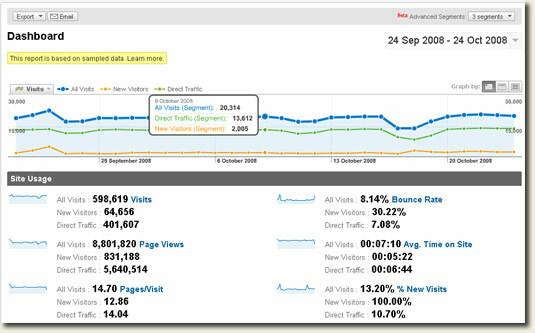 New Google Analytics Segmentation – Wow! I’m using the new GA segmentation, and all I can say is WOW. This is going to blow you away. Prepare to see your data in a whole different light. Previously you’d be looking at enterprise-grade analytics to get into this level of data manipulation, so this is going to be a game changer. You are writing very well, but what does this New Google Analytics Segmentation need for? I have been playing with the segmentation over the weekend to try get some data on a large account. Google Analytics looks set to become one of the best products realised by GA, the data you get back is second to none ..
Agree 100% – GA is starting to look like a tool larger sites could use. And given that you’re now getting functionality that previously cost very serious money I imagine some enterprise vendors must be quite worried. Are you going to elaborate on your Wow! with a more in-depth analysis/review? Look forward to, if so. Advanced segmentation was a missing feature of Google Analytics. All other enterprise analytics tool were offering it, but now Google is giving it free. You can now dissect data much easier (segmentation was possible even before in GA, with custom filters and profiles, but now it is much easier). I am planning to create a series for segments idea. The first segment we have described on the page I’ve linked to in my signature. Please have a look. Feel free to visit our blog and if you have any ideas on what segments could be useful, leave a comment and we will try to write a post on that one. It certainly is amazing the stuff that Google gives away for free. I have been tinkering with the new GA features myself and (although it isn’t as robust as some paid analytics services I have seen) it is pretty awesome. The new GA features are seriously top notch! I have not had time to fully investigate but from what I have seen so far I am very impressed. Richard, I too would be interested in hearing about this in more detail. it is a very impressive feature for sure. Have a spectacular new year Richard.